Before the official opening and the first plenary talks a movie about science and technology in Chicago, the Windy City, was shown to the audience. Photo by ICHEP Press. From 3rd August to 10th August the International Conference of High Energy Physics (ICHEP) took place at the Sheraton Hotel in the heart of the windy city. More than 1400 scientists, students and industrial representatives from all around the world were attending this major conference to present their research and discuss exciting results in High Energy Physics (HEP). Especially the leaked news about a possible bump in the ATLAS and CMS data was a hot topic which sadly vanished with more statistics. But many other experiments and results were presented and of course the ILC and CLIC status updates and ongoing works were among those. For the first LHC run in 2015 a cluster has been spotted at 750 GeV. The so called 750 GeV bump was suspected to be a new discovery – at least for some scientists of the field. Before the beginning of the conference there had been some excitement about the possibility that the bump remained even with the new 2016 data. As it turned out this was unfortunately a glitch in the statistical analysis and with the new update – a combination of 2015 and 2016 data – the bump has vanished entirely. It might sound like a setback for the LHC but it was not. More than one hundred other very solid results were presented for the Higgs study, top quark measurements, Dark matter search, exotic particles and supersymmetry searches. In a 45 minute session the absolute highlights of the four experiments were presented. Even the two speakers stressed that they had to be very selective due to the shortness of their time and the huge amount of results. 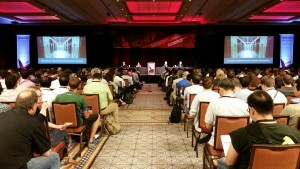 More 1300 scientists from the high energy physics community were at ICHEP and nearly all seats were taken during the plenary sessions of the conference. Just before the LHC results and after the official opening of the conference talks about the discovery of neutrinos oscillations and gravitational waves were given as special highlight of the conference. Takaaki Kajita, Nobel Prize winner 2015, from the University of Tokyo presented the long history of the Kamiokande and Super-Kamiokande experiment. “The basic structure of three flavour oscillation has been understood but many open questions remain”, said Kajita. In a later session about future facilities he mentioned that a Hyper-Kamiokande collaboration has been established. They are considering and planning a new neutrino detector with a diameter of 72 metre and a height of 60 metre. Nergis Malalvala from Massachuetts Institute of Technology (MIT) presented the discovery of gravitational waves. Two black hole collisions and the clear evidence of the gravitational wave were detected during the LIGO (Laser Interferometer Gravitational-Wave Observatory) run in last autumn (September, 2015). “We might have heard the loudest collision since the big bang with our first event”, said Malalvala during her presentation. The black holes that collided were much bigger than any other black hole ever observed with other observational methods. Of course the questions after the talk were lively and it was speculated if we will hear a louder event in the next run. Following in this session were talks about the status of CLIC and the progress on an electron-feedback system at nanometre level which can fulfil the very different requirements for both machines – CLIC and ILC. Afterwards a status from KEK regarding the cryomodule performance and coupler R&D was given by Yasuchika Yamamoto. It was followed by a talk from Akira Yamamoto about the ILC technical progress and prospects. He introduced a plan for ILC cost-reduction R&D between Japan and US that was set into motion with a focus on the SRF technology. “With this plan we demonstrate that the ILC key accelerator technology is ready for the project realisation”, said Yamamoto. During the top quark and electroweak physics session Aleksander Filip Zarnecki, Professr at the University of Warsaw, talked about physics opportunities for measuring the top quark at the ILC and CLIC. The top quark is the heaviest elementary particle and it is still the most unknown one among all the quarks. Measuring its coupling with the Higgs boson or other particles is an ongoing search at the LHC and part of the physics case for either the ILC or CLIC. “It can be the testing ground for quantum chromodynamics and maybe even open the window to new physics” said Zarnecki. He presented the detector requirements for precision measurements for the top and showed how the ILC and CLIC both address this challenge. They will use the so called “particle flow” method to measure the energy and to reconstruct the jets. With the high-granularity calorimeter the aim is to track each single particle in the detector. The two ILC detectors, ILD and SiD, are prepared for this as is the CLIC detector which is based upon both those detector concepts. Especially within the detector development the collaboration between the two projects is clearly visible.